Hybrid Camera Revolution: Which $3000 camera should you buy - Sony A7s II or URSA Mini 4K? 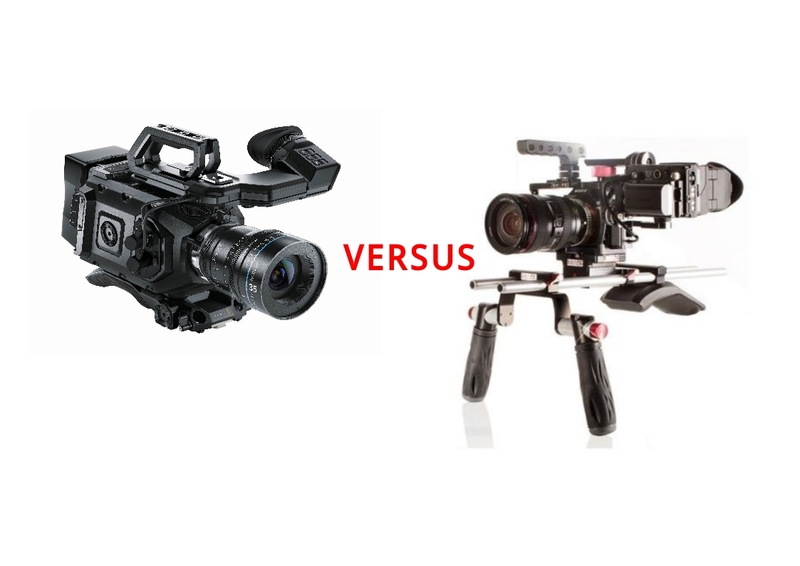 Which $3000 camera should you buy - Sony A7s II or URSA Mini 4K? Over the past couple of years, as Sony has introduced more and more capable full frame video cameras in still camera bodies - and as Blackmagic Design has driven the price of 12-bit RAW Super 35 cinema cameras downward - shooters have had an increasingly difficult time deciding whether to buy a high end hybrid camera or a RAW-capable budget cinema camera. Still/video hybrid cameras have had the advantage that they are relatively light and can do double duty as still cameras. And although their highly compressed codecs and 8-bit color spaces aren't the greatest for grading, LOG profiles and increasingly clever compression algorithms have made up for these shortcomings (especially on the small screens where most content is displayed). One thing they haven't been able to overcome, however, has been the inherent limitations of the still camera form factor. There isn't the volume to fit XLR input jacks or dual card slots - and shooters generally need to spend extra money on cages for these cameras to mount accessories - plus ungainly shoulder rigs for steady handheld shooting. But low-budget cinema cameras have had their problems too. Early cameras from Blackmagic didn't have XLR inputs. Nor did they have dual card slots or ergonomics that were conducive to shoulder mounting. And, although the 2013-era Blackmagic Production Camera 4K was a bargain compared to a 4K Super 35 camera from Sony or Canon, it was still expensive (and an ergonomic disaster) when compared to a standard mirrorless still/video hybrid camera - which was typically less than $2000 and had interchangeable batteries, a usable viewfinder and was easier to operate than the BMPC 4K.. This year, however, something has happened that changes the conversation. The two trends have finally met in the middle - with the introduction of the new Sony A7s II (street price $2998) and the $2995 Blackmagic URSA Mini 4K (both likely to ship in October). Both cameras are relatively lightweight, with decent ergonomics and the ability to record high quality UHD to LOG profiles. Both cameras have already shown they can create cinematic Super 35 (URSA Mini) or full frame (A7s) motion images. With body-only prices at just less than $3000, these cameras seem to be similarly priced. But neither is really ready to take out on a shoot straight out of the box. This begs the question - once these cameras are rigged up and ready to shoot - are they still price competitive? To help the typical DSLR or mirrorless shooter looking to upgrade to one of these two cameras, HCR has put together two charts, the first comparing upgrade prices for the typical DSLR upgrader and the second comparing specs. For the sake of argument, we'll assume that this 'typical' upgrader already has Canon EF lenses and an HDMI EVF (or plans to use the Sony's built-in EVF) - but needs an audio solution and a new cage/shoulder rig compatible with the A7s II. Of course, these assumptions won't be true for everyone, but we have to start somewhere. So, micro-budget filmmakers with EF lenses who don't mind shooting with a $599 800x600 viewfinder (instead of Blackmagic's $1495 1920x1080p viewfinder) can get URSA Mini 4K up and running for about $4395 - while a similar Sony A7s II setup would cost a little more, at around $4460. These totals are approximate - shaving a few dollars off the A7s II shoulder rig and buying an external recorder rather than a JuicedLink preamp would get the price down for the hybrid camera - but the total cost of getting these cameras ready to shoot is about the same (for this set of assumptions). Weight 5 lbs. 1.3 lbs. So how do the specs compare? The URSA Mini, with internal RAW recording and a global shutter, generates high quality images that stand up very well to color grading and camera motion. But (outside of 8MP freeze frames) URSA Mini is not a still camera, needs supplemental lighting in low-light situations and has no in-body stabilization. The A7s II, on the other hand, is lighter, smaller and the clear winner in low light - but is likely to be more susceptible to "skew" resulting from camera or subject motion - and its 8-bit codec will have a more limited color palette in the grade. HCR's bottom line for these charts - even though the ready-to-shoot costs are similar, these are two very different cameras with unique strengths and weaknesses. As always, which one you buy or rent depends on your specific needs and preferences and not on comparison charts. That said, these numbers have broader implications. They show that you can get an ergonomically friendly 4K Blackmagic RAW cinema camera up on your shoulder and ready to shoot - for less than the price of a RED RAVEN brain or a body-only (8-bit) Sony FS5. This could be a problem for Sony and RED. If this post has helped you to make a buying decision, please use the links above or the display ads in the margins to make your purchases. It won't cost you anything extra, and it will help keep these posts coming. What a great comparison. I've been thinking for a long time between which is the better solution. Ideally I would want both, one to beautiful daylight motion like shots, and the other for creative night scenes. Given that the slog does still give some leniency, I am leaning towards the a7s2 simply because it gives me more creative options, though I am wondering if it up for the task of making an independent film.